Kazoo simplifies the often bewildering process of self-publishing by providing a comprehensive and professional editing, design and publishing service under one roof. We work closely with you to make sure your book is of the highest standard before print and digital publication. The process takes an average of eight weeks from start to finish. It is important to us that your book reaches the highest standards and that you are completely satisfied. When you have taken a good look through our website, contact us by e-mail or telephone with any questions you may have about our service. With over 50 years’ experience in the publishing industry there is no question we cannot answer. Talk to us to ensure you are completely happy that our service meets your needs. When you have discussed your project with us we will send you a quotation based on your specific requirements. We will then send you an Author Agreement so that you know exactly what is required by us from you, and exactly what we will deliver. You will also receive our Author Questionnaire seeking information about your book. This includes sections on the information that will go on the book cover (blurb), a cover brief and other information we require to ensure that your project runs smoothly. Kazoo Guide to Building Your Brand Online. Kazoo Guide to Releasing Your eBook. Kazoo Guide to Claiming Back Tax on Your Royalties. Kazoo Author Agreement & Cover Questionnaire. Kazoo Editorial House Style. To ensure your book meets industry standards, we provide copy-editing guidelines for you to follow. Our aim is that your book will compete on an equal footing with traditionally published books. Our house style will help you to make sure your spelling, grammar and punctuation are consistent. We provide seven sample design layouts for your book and are happy to quote a for a custom designed layout. Choose the most suitable for your project. Completed and signed the Author Agreement. Completed and signed the Author Questionnaire. Supplied your final manuscript. Apart from proof corrections, there can be no changes made after submission without incurring additional charges, so it is essential that your book is finished when you send it to us. 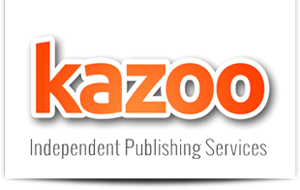 Agreed payment terms by credit card, PayPal, cheque, banker’s draft or postal order made payable to Kazoo Independent Publishing Services. Work will begin on your manuscript as soon as payment has cleared. Once you have briefed our team and completed all the paperwork, one of our cover designers will contact you to discuss any areas of the design brief that need to be clarified. The designer will then produce your cover proof and send it to you for approval. An unlimited number of revisions can be made at this stage to ensure that you are completely happy. Cover design takes approximately four weeks and runs parallel to the production of your text. While your cover is in production, your book will be typeset and proofread. You will receive a pdf copy of your book to check that all corrections have been inputted correctly, and you may make one round of corrections to this proof. After your corrections have been applied to your satisfaction you will sign-off on the interior of your book. It will now be finished and cannot be altered pre-print. You will receive a printed proof copy of your book to confirm everything is in place. When you have signed off on this, the printing process starts. Your book will then be printed, converted to the mobi and ePub formats and uploaded to the various retail and wholesale sites. This process takes approximately eight weeks.